For an assortment of Free Coloring Pages To Print, click on any of the links below. These coloring pages include Disney, Hello Kitty, fairies, Winnie the Pooh, holiday themes, landscape scenes, flags, maps, and more. 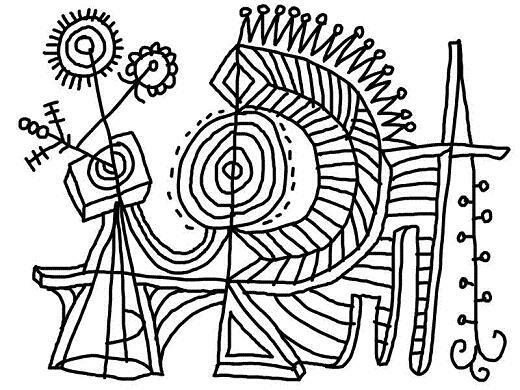 Shown above is an abstract coloring page, perhaps inspired by Pablo Picasso. Scroll down for a broad assortment of coloring pages. Print out your favorite cartoon characters. Color your own flags and maps. Create your own abstract design elements. Be sure to check back often, as new coloring pages are being added here all the time. Click the link at the bottom of this page for another fun collection of coloring pages with a distinctly patriotic theme. HELLO KITTY Everyone's favorite fussed-over feline awaits your coloring expertise. Perfect for Preschool Coloring Pages. FINDING NEMO We found Nemo! Now go find your orange marker and color him and all his friends. STATE FLAGS Featuring flags from all fifty states, with links to more printable flags. NATIONAL FLAGS Featuring flags of many nations, including links to Native American flags and more.